Impatiens are a large genus of half hardy annuals or perennials that are normally grown as half hardy annuals in the garden. Impatiens range in height from 30 to 60 cm (1 to 2 feet) and carry flat open flowers of vibrant pink, orange, red, white or purple. They bloom from the end of spring until the first frost of the winter. Some of the common names for Impatiens include Busy Lizzie, Touch me not, Balsam, Patient Lucy, Snapweed, and Lady's slipper. 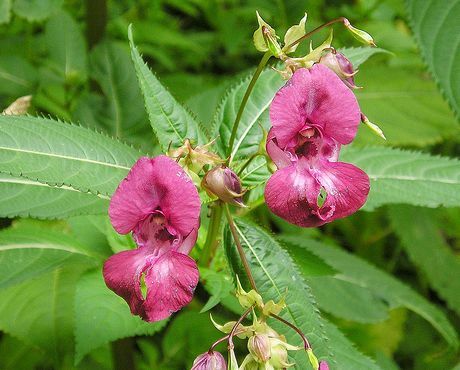 Latin names include Impatiens parviflora, Impatiens balfouri, Impatiens auricoma and Impatiens walleriana. Impatiens glandulifera – Himalayan Balsam, Kiss me on the mountain by Blumenbiene. Impatiens walleriana Busy Lizzie by Wm Jas. Common Names: Impatiens, Busy Lizzie, Jewelweed, Balsam, Snapweed, Touch-me-not. Height: 20 to 78 inches (50 to 200 cm). Native: Northern Hemisphere and tropical regions. Growing Region: Zones 3 to 10. As a perennial in zone 10. Flowers: Spring until first frost. Flower Details: Most colours: common ones include pink, red, orange, white and purple. Shoe shaped spur. Some species have flattened flowers similar to violets. Foliage: Shiny leaves. Greasy feel on the adaxial side of the leaf. Variegated. Sow Inside: Use vermiculite. Water from below. Keep humid. Germination time: one week to one month. Temperature 75°F (24°C). Two to three months before expected last frost. Transplant outdoors three or four weeks after the last frost; minimum temperature should not drop below 50°F (10°C). Requirements: Shade for best results; partial shade is fine in cool areas. Prepare soil first by mixing in manure. Soil pH 6 to 7. Rich soil. Moist soil. Supply a couple of feeds. Regular watering. Pinch tips of young plants. Propagate: spring or autumn cuttings. Miscellaneous: Impatiens means impatient. The genus gets this name for the way that it disperses their seeds explosively if they are touched. When planting Busy Lizzie and other Impatiens members in the garden the seed should be sown on the surface following the last frost of spring. Busy Lizzies like to grow in a shaded area of the garden, though is tolerant of sun. 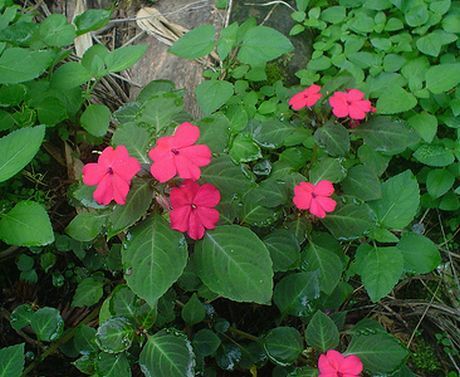 Impatiens plants prefer a rich, well manured soil of pH 6 to 7. If you first plan to grow Busy Lizzie and other Impatiens species indoors then the process should be started about 9 or 10 weeks before transplanting out a few weeks after the last frost of spring. Sow the seeds in vermiculite and supply high humidity and a temperature of 21 to 24 degrees (about 50°F). As plants are partial to leaf rot it is important only to water the seedlings from below. The germination time is from one to four weeks. Once growing Impatiens should be pinched back to encourage branching. They should be fed a couple of times, and be well watered. If you would like more plants then cuttings can be took in spring or autumn. Alternatively let the plants set seed in situ.